Physicians treat patients’ illnesses and conditions, researchers pursue cures to these same maladies. The combination of these two closely related disciplines is found in the M.D./Ph.D. dual degree program. The M.D./Ph.D. 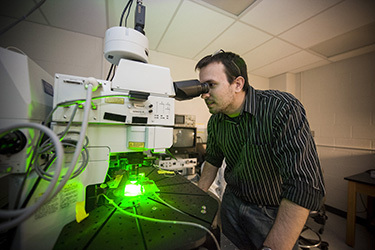 program at Wright State uniquely prepares graduates for diverse areas of research where discovery is facilitated by close interactions between the laboratory and patient care settings. During the first two years of this program, the student completes the pre-clinical portion of the medical school curriculum and two research rotations. The research phase then begins as the student selects a research focus from any of our four areas of concentration. All of our thesis mentors are strongly committed to including M.D./Ph.D. students on their biomedical research teams. The next three years are focused on cutting edge research, and the defense of the resulting dissertation. Lastly, the final two clinical years of the medical school curriculum and the boards are completed, and the student receives both the M.D. and Ph.D. degrees. Dual degree graduates find challenging and highly rewarding careers working as physician scientists in settings across the entire health care spectrum. They often become faculty members at medical schools, universities, and research institutes. Potential M.D./Ph.D. students must first be accepted into the Boonshoft School of Medicine. Visit the Boonshoft School of Medicine Admissions page to learn more. Dual-degree candidates must also apply for acceptance into the Biomedical Sciences Ph.D. Program through the Wright State University Graduate School. Visit the Graduate School Admission page to learn more. An applicant's MCAT scores may be used in place of the GRE score requirement. Original transcripts must be sent to the Graduate School. Please contact the program coordinator of the BMS Ph.D. Program once your application has been submitted to request that the MCAT scores are sent from the Boonshoft School of Medicine to the Wright State Graduate School. Students accepted into the M.D./Ph.D. program will be offered some combination of stipend and tuition remission. Visit the Boonshoft School of Medicine Combined M.D./Ph.D. Program page for more information.